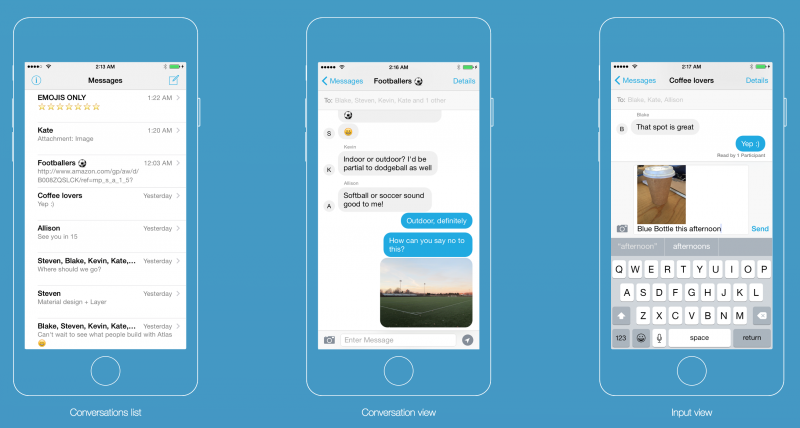 Start-up company Layer is ready to open its new messaging platform to everyone starting today. The San Francisco based company claims to offer the infrastructure and developer tools to bring “iMessage” quality messaging services into any third party app. Layer’s front end platform, known as Atlas, provides a number of dev tools in order to implement messaging into any iOS or Android app. Atlas has been described by some as way to take iMessage, integrate it into your own app and customize it to your liking. It supports all the usual fixings of messaging service including media content and more. Apps like Pop and Imoji are both already making use of this tech as two of Layer’s early adopters. Layer CEO Ron Palmeri, who was previously responsible for the voice app that eventually became Google Voice, said the company remained in a testing period to ensure reliability. Now serving as many as 1,500 customers and with about 10,000 requests made over the last year for access, Layer is ready to open up further. With its beta testing period now over, both Atlas and Layer are open to companies and developers at the official sites.